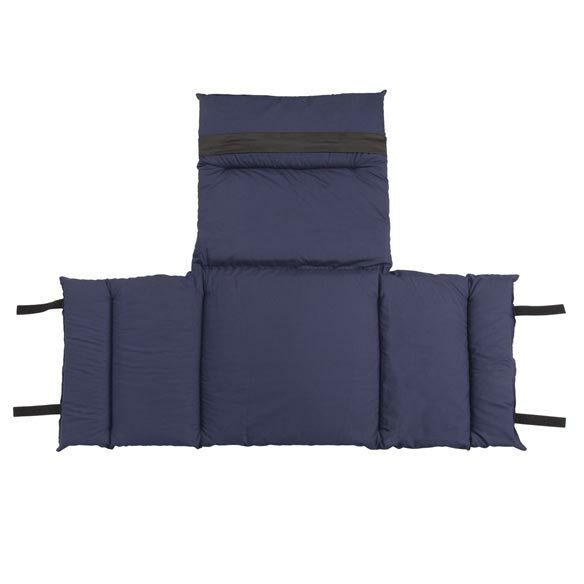 Get comfortable on our pressure reducing cushion for wheelchairs that really stays in place. 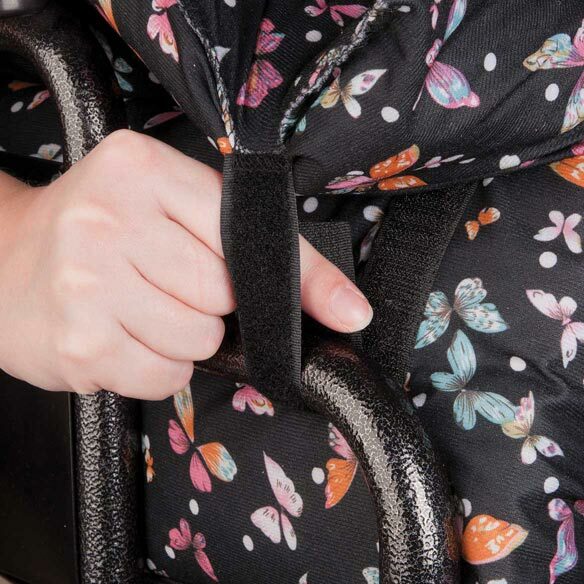 Unlike many other wheelchair cushions, this cushion features useful hook-and-loop closures that secure the cushion around each wheelchair arm, as well as a back strap that prevents the cushion from flopping or slipping. This cushion is also an excellent addition to armchairs, providing wonderful pressure relief and enhancing overall comfort. Choose from two different design options to suit your personal style. 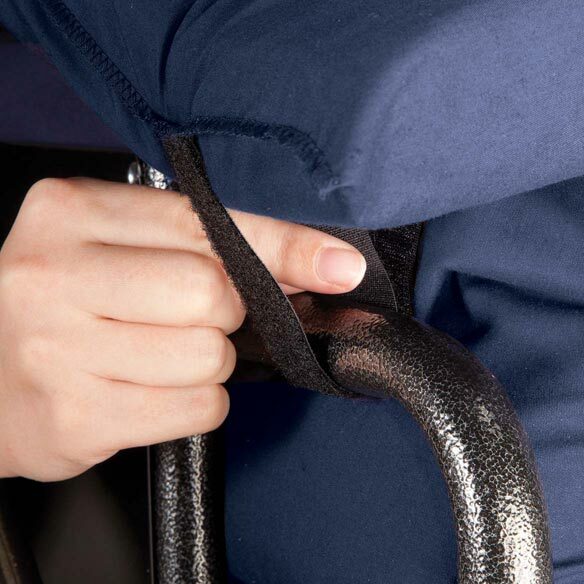 One benefit of the unique design of this pressure-relieving cushion is that it adds softness and reduces friction in all areas of the wheelchair, not just the bottom seat. The wheelchair arms, back, and sides will be covered in plush padding and protective fabric, eliminating discomfort. 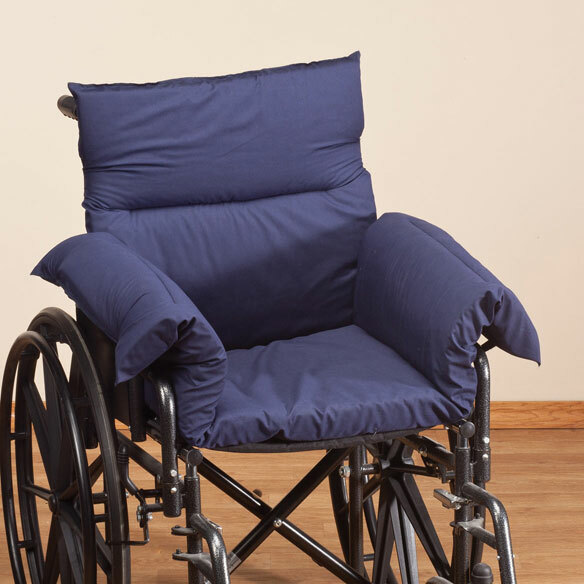 Versatile, stylish, and high-quality, this wheelchair cushion can help you or someone you love sit more comfortably. For when we are waiting in Dr. office to make wheelchair more comfortable. 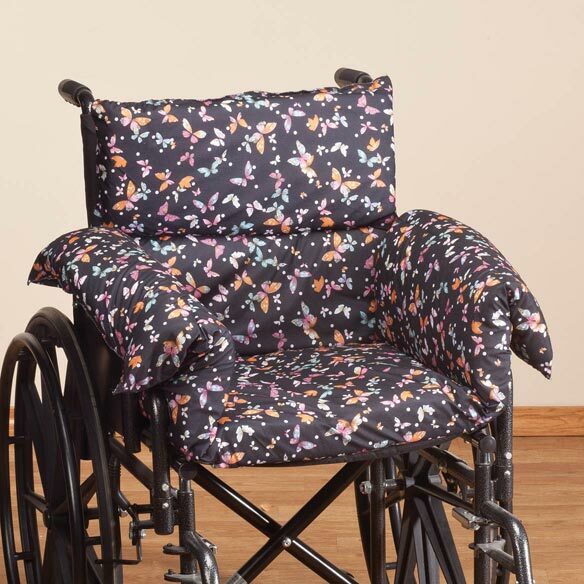 My 91 year old mother needs support cushions in her wheelchair and this one has pretty butterflies and not just plain. Hopefully my chair will be more comfortable and I won't have to worry about cushion sliding around. Nice that it also covers the arms, which are greatly worn on my chair. For my 90 year old mom who is in a wheelchair. I am looking for a solution to make my mother more comfortable in her wheelchair. My husband can no longer walk because of Parkinson's. He is sitting all day and when not he's being transported with a wheelchair. I hope this solves the problem of him leaning when he's in the chairs and filling in the space from his weight lose. Wife needs cushion in wheelchair. I am in a wheelchairs and I need somthing like this to help me while am sitting. To make Mom's wheelchair more comfortable. Because I'd like a smoother ride! Looks like it will be comfortable for my mother to use. i had bought a similar item, it didn't have the arms, for a friend who is in wheelchair. She liked it because it wasn't high and it can be machine washed. I'm very small and needed height in cushion and softness on arm rest. Straps to secure it and color. Did not choose flowered pattern--chose navy blue pattern. Hope to make wheelchair more comfortable. To help my mother be comfortable. My father is very thin these days- no padding at all! Barely rubbing an arm can cause bleeding. This looks like it would give him more comfort in his wheelchair than he has now. To relieve pressure on joints. My mother is wheelchair confined and needed to make it more comfortable for her. It is very comfortable for daily use. Because wheelchair we have needs a big cushion for person using. To make my mom's wheelchair more comfortable. Will this fit an over sized wheelchair for heavier people? BEST ANSWER: Thank you for your question. The chair cushion measures 42” x 38” please measure your current chair to find out if it will fit. We hope this information will be of help to you. BEST ANSWER: Thank you for your question. The inside of the cushion is polyester fiberfill. We hope this information will be of help to you. Why can't I select a style? What is the problem with your web site, I con't select a style? BEST ANSWER: Thank you for your question. There are two colors navy blue and butterfly. You can use the drop down list to the choose the color. We hope this information will be of help to you.